A.R. 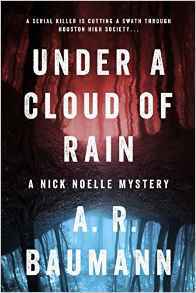 Baumann is the author of the new mystery novel Under a Cloud of Rain. An actress and screenwriter, she lives in San Francisco. Q: Why did you decide to set your mystery in Houston in 1970? A: I grew up in Houston and as a teenager I remembered a murder committed there. Houston in 1970 was a good ole boys town where the leading families controlled the city. The city is a nightmare of humidity, sweat, heat and tropical rains during the summer. I loved it for the background to my novel. Q: Did you know how the book would end before you started writing, or did you change things around along the way? A: Yes, I knew the ending, but how I got there was a mystery. I kept writing one scene after another until I had a really rough draft. After I finished the scenes, with the help of my editor, I placed them in order as chapters in the book. Afterwards, I wrote the climax. Q: How did you come up with your character Nick Noelle? A: Nick Noelle was a Cajun copy of the detective, Popeye, from the movie, The French Connection. Nick's gut intuition and street smarts made him my protagonist even though he is a gambler, a drinking man, and a woman chaser. A: Oh my God, that is a difficult question because there are so many great writers who have inspired me. Some of them are W. Somerset Maugham, Truman Capote, Shakespeare, Tolstoy. And mystery writers Peter Straub and Stephen King. A: I am working on a fictionalized memoir but I don't want to publish it. It's for me, my children and grandchildren. I am also working on a novel placed in Mississippi in the 1940s. There’s a little bit of everything in there: bible belt preachers, the KKK, a jewel thief who gets her revenge on all of those who harmed her. A: In my family, I was the youngest and could never match my siblings who all wanted my mother's and father's attention. When I would say anything in childhood, I was corrected by my parents and siblings. Of course, that doesn't happen anymore but it left a profound effect on me. I write to be heard.